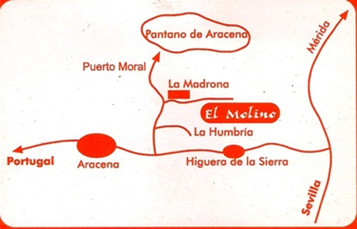 Our Ashram is located at one of the most beautiful corners of Spain: the Natural Park of Sierra de Aracena. Neither winter nor summer takes the greenness away from its landscapes covered in oak cork trees, holm oak trees, and chestnut trees, crossed by natural springs and streams, and having the swamp of Aracena not far from El Molino. This nature area offers to lovers of nature some twenty trails crossing it, and it is a sample of the Architecture of yore with its old castles and small and white villages. You can contact the official site of the Nature Park for more information and proposals about visits, hiking, etc.